Watersong is nestled in an isolated cove (Dewey's Cove), which snuggly protects us by keeping some of the harsher Flathead Lake weather and higher waves from reaching us, and allows for more gentler, warmer water. This is one of the amenities that makes Watersong so valuable. Our kids paddle board throughout the cove and dive off our expansive covered boat dock, which can accommodate large boats. Our kids think of the cove as their own large, private swimming pool, and we do not disabuse them of that thought! Kids, especially, delight in the nearly 200 feet of lakefront, where they cook s'mores and hotdogs on the beach fire pit, then enjoy their feast on two adjoining picnic tables, chairs, chaises and benches. Adults can join in, or relax and supervise from chaise lounges on the lengthy dock. After a barbecue on the upper deck of the remarkably gorgeous Main Home, you may want to relax in four different lounge areas and enjoy the peacefulness of Dewey's Cove, which not only protects us from stronger winds and higher waves experienced elsewhere on Flathead Lake, but it also offers additional privacy, while still showing off jaw-dropping views of the Mission Mountains, as they stretch toward the heavens with peaks that often stay snow-capped well into the summer. The Great Room truly is magnificent. It boasts soaring ceilings with an equally tall rock fireplace on which 'Teddy,' a huge trophy elk, with a 6' antler span, shot by a direct, name-sake descendant of one of our country's greatest presidents, lovingly guards his guests, below. Beautifully furnished, the home features warm, radiant-heated hardwood floors, an upscale gourmet kitchen, complete with Sub-Zero refrigerator, travertine marble countertops, gas range, dishwasher, disposal, bronze fixtures, and other amenities consistent with a higher-end home. The spacious master bedroom, tastefully decorated in true mountain-lodge style, offers a California king bed, walk-in closet, two dressers and an entertainment center/flat screen smart TV and DVD player. The expansive master bathroom features a sumptuous Jacuzzi bath with a full view of the lake, a walk-in tiled shower, and a vanity counter with two sinks. The downstairs master bedroom, with a smart TV and DVD player, walk-in closet, is a horse-lover's dream, with the equestrian motif expanding into a full bathroom that features a two separate vanity areas, for added privacy. Another downstairs bedroom, with a Murphy bed, has built-in cabinetry, complete with a desk that is ideal for those who have some office work to complete. This office work, however, comes with a gorgeous lake view, making it more pleasure than work. The home also has a downstairs living room with a Smart TV and DVD player, an electronic basketball game, and two twin sleigh beds. There is a set of bunk beds, with a pull-out trundle, in the loft. The loft also features a small office-library. The loft has a log balcony with slats, so younger children should not use this area. The home has numerous amenities, including a laundry room with a large washer/dryer, wireless Internet service, a landline, books, four flat-screen Smart TVs for Netflix, DVDs, and much more. The charming Guest House, which is rented separately for those who have more than eight people in the main house, is uniquely furnished in darling cabin décor. It has a kitchen with dishes and cooking supplies, a full bathroom with shower and tub, a deck to enjoy the spectacular views, and sleeps three, with a queen bed and a pull-out love seat that sleeps one. We emphasize that the Guest House is rented only in conjunction with rental of the Main Home. It is not rented by itself. As with many mountain-lake alpine log homes, Watersong does not have air conditioning; however, the Main Home has four sets of lovely Pella French doors, plus a screen door onto the laundry room deck. The Guest House has one set of Pella French doors, plus a front screen door. By keeping the screen doors and screened windows open, the home gets a smoothly-flowing current of fresh lake-and-mountain air, augmented by ceiling and other fans. The lower level of the home normally stays cool. The daytime temperatures, however, especially in July and August, can reach into the upper 80s and lower 90s; so, if you are extremely heat-sensitive, please keep this in mind. We want to ensure that the people who rent from us are respectful of the property and will treat it with the same nurturing care that we do; therefore, before we agree to rent, we will ask you please to tell us about the people who would be staying there, and to confirm that you are there for a private family vacation, and not for a large gathering of any sort. If someone is looking for a venue for a large gathering, with more than four cars, and more than 11 people on the property (without written permission by us), this is not the home for them. Watersong is available for small family vacations, only. This is a private high-end, family home; so, for guests who want a raucous party or a large gathering, this is not the home for them. Neither is it a home for small children; however, for those adults with children who are mature enough to respect the property of others, and who want to experience the serenity of nature at her aesthetic best, this most definitely is the place for you. We want to make certain that your vacation experience is optimum by ensuring that the home, and the terms and conditions of renting it, are a good fit for your vacation needs as well as for us. Please review a sample Rental Agreement for the Main Home and Guest House, which we have provided on this site. If you cannot find them, please let us know, when you inquire about the property, and we will ensure that you get them. If, after reviewing the Rental Agreement(s), you want to proceed, you can let us know and we can move forward with a Customized Rental Agreement, tailored to your specific needs, which we will email to you. Those who have rented from us in the past have given many glowing 5-star reviews, mentioning not only the beauty of the property and views, but also how easy we are to work with; so, if you have any questions or concerns, please let us know. We, also, are happy to send pictures. The property is located along a private drive--guarded by two 20' totem bears--which leads you to the home, to which you will want to return every year. IT'S "HIGH, WIDE & HANDSOME"
UNDER THE BIG SKY COUNTRY OF MONTANA! Glacier National Park is but an hour away. The quaint towns of Lakeside, Bigfork, Polson and Sommers are close by and offer shopping, marine rental, and a variety of dining experiences. Bigfork boasts a professional summer theater, galleries, golfing, fun nightlife, and wonderful restaurants. The larger city of Kalispell is only 30 miles to the north, and extends the best of urban experiences, tempered with the ambience and feel of a smaller mountain community. You also will not want to miss Whitefish, a uniquely upscale resort town with high-end galleries and restaurants, surrounded by breathtaking mountains and, of course, some of the best skiing in the world. Legendary newsman, the late Charles Kuralt, once called Glacier National Park's "Going to the Sun Highway," the most beautiful road in the world. Travel it and you will see why. With pristine forests, pure mountain lakes, and over 700 miles of trails; and, of course, the glaciers, you won't want to miss Glacier National Park. All of these sites, literally, are in our backyard, and none is over an hour away. Just two miles south of Watersong is the Rollins General Store. It looks from the outside like it came straight out of the Frontier West, and that's because it did! For quick food items, it’s convenient and is locally owned by friendly folks who are glad to tell you just how lucky you are to be in God's Country. The General Store also serves as Rollins' Post Office. Watersong is a luxurious lake home you never will want to leave. Looking from the home toward the deep, magical waters of Flathead Lake, the largest fresh-water lake in the western U.S., you realize that people come from all over the world to experience the beauty of Montana mountains and lakes, and that there are none more scenic than from the decks of this spectacular home. Watersong provides the best of the outdoors enjoyed within the comforts of fine living. It is nature's perfect antidote to the chaos of our everyday world. Start each day with your favorite warm beverage, walk down to the dock, which extends well into the lake, and greet the sun as it gently rises over the mountains. It's a vision to last you a lifetime, and it's a life-changer. MAIN HOME: We prefer no more than 8 overnight guests in the Main Home, but will consider more on a case-by-case basis. For more than 8 guests in the Main Home, there will be a charge of $600 per person, for up to 11 guests, per week. For more than 8 overnight guests, renters are encouraged to rent the Guest House. The Main Home features 2 master bedrooms (one on the main level and one on the lower level), each with its own master bath; a loft with 3 bunkbeds; 2 sleigh beds and1full bed; 2.5 baths. Main home rents for $750 per night + $400 cleaning fee + 7% Montana Lodging Tax + $1,000 refundable damage deposit. Shelley worked in higher education for over 20 years. Larry has been one of Montana's top, award-winning financial advisors for nearly 40 years. We have two grown sons and a daughter who plays basketball for Montana State University Billings, where Larry also serves as a trustee. We live in Billings, Mont. We are native small-town Montanans (Larry was raised on an eastern Montana ranch, Shelley in Laurel) who love our state and delight in seeing others enjoy it as well. Shelley is retired and writes for several magazines. We like to boat, swim, drive around the lake, and go for quiet meals in the area villages, which boast their own brand of originality. Each has its individual charm; the people are friendly and welcoming. Our kids like to jet ski, water ski, go water-tubing, boating, plus swim and paddle-board in the calm waters of Dewey's Cove, right off our dock. In the evening, we barbecue on the upper deck of the home, then bring the food down to the beach, after which the kids will light a fire in the open fire pit and cook s'mores. We often sit on the extensive dock and watch the sun set. There is a bald eagle that frequents a certain tree on our property, and geese that live on our shore. White-tail deer come into our front yard nearly every evening. What a Montana treasure! My favorite thing to do, however, is to enjoy a good book while sitting either on the upper deck of the home or on the boat dock, savoring the gentle, pine-filled breezes of Dewey's Cove, appreciating the backdrop of those magnificent Mission Mountains; and, of course, drinking in the view of the most gorgeous lake in the world. toilet, shower, jetted tub, Jacuzzi has spectacular views of the lake. The expansive master bathroom features a sumptuous Jacuzzi with a full view of Flathead Lake, a vanity counter with two sinks, and a tiled walk-in shower. Each bed has two extra sets of sheets, many of which are lodge-themed, featuring moose and bear. Two gas fireplaces, a large one upstairs and another downstairs, will be available beginning in fall 2018. Because the property is located on a private drive, and privacy is paramount, no more than four vehicles are allowed on the property unless permission from the owners is obtained. The garage is not available during the summer of 2018,, but will be available beginning fall 2018. Plenty of bath, hand, and beach towels, and washcloths. The Great Room features a 30-foot rock fireplace, with a massive elk, shot by the decendent of one of America's greatest presidents, overlooking the guests; a 2nd livingroom is downstairs. Flat screen, Smart TVs in the Great Room, master bedroom, downstairs livingroom, horse-themed bedroom, guest house; all have DVD players; extensive library of DVDs, Netflix. No cable or satellite TV. Extensive library in loft, with more books in bookshelves throughout the home. 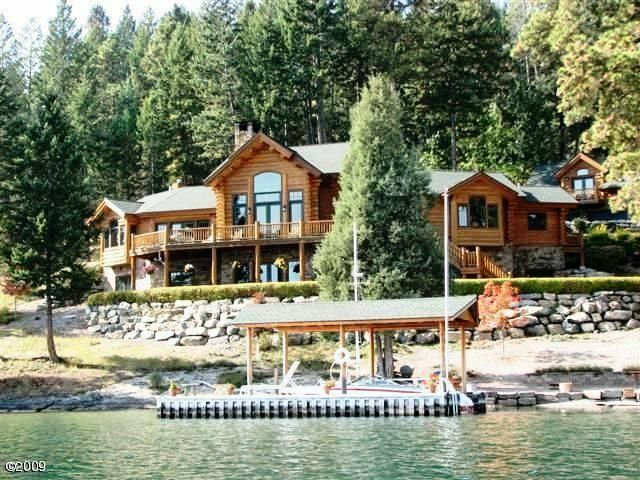 Extensive, covered boat dock, with Adirondack chairs on upper deck of the home for viewing Flathead Lake and Mission Mountains. Flathead Lake, the largest freshwater lake in the western U.S., is spectacularly beautiful, especially with the backdrop of the Mission Mountains to complete the view. People come from all over the world to experience the beauty of Montana mountains and lakes, and there are none more scenic than here. Watersong cabin was beautiful and very well supplied. The view from the decks were lovely and the whole area was very peaceful. We were treated to daily viewings of the local deer and wild turkeys. We enjoyed our stay very much. Thank you so much for your review. It was a pleasure having you, and we look forward to your return visit! Watersong provided the perfect location and amenities for our family vacation in western Montana! It was absolutely georgeous, like “a place that you dream about” according to my son. We originally thought that we would spend more time at Glacier National Park, but ended up spending most of our time enjoying Flathead Lake at the cabin and the immediate surroundings. We particularly enjoyed the waterfront and boat dock outside the back door. It was amazing for our family which lives for boating together. The cabin was beautifully decorated, clean and well stocked with everything that we needed. Shelley Van Atta (owner) treated us as if we were family and provided excellent service with ideas and directions to activities in the vicinity. We can’t wait to visit Watersong again to create more memories that will last a lifetime. You and your family were an absolute delight and we look forward to having you return. I am glad, too, that some of your family enjoyed staying in the guest house. It is such a darling place that affords an extra measure of privacy, and the views from the balcony are magnificent. Every year we add extra luxuries, so please hurry back! We loved our time at the house. Very comfortable, lovely amenities. Highly recommend to anyone who asks. Looking forward to your return visit! House was great really had a nice time. We are making even more improvements, with added luxuries, so please hurry back! Wonderful views from a beautiful home! We had a wonderful week, full of lake time and being leisurely on the big back deck and enjoying the incredible view. The home was beautiful and comfortable and we thoroughly enjoyed our stay, and hope to stay there again in the future. Please hurry back! You and your family are a delight, and you now, officially, are members of our Watersong Family. Such an amazing home, we looked all around the lake prior to finding the Van Atta house and we were beyond amazed by their home. Honestly, words and picture do this home no justice. There were five of us staying there and were primarily interested in laying low and relaxing from our hustle world of the big city life. The house has plenty of room and we spent our days sitting on the dock and on the deck of the house staring off into the amazing Montana skies. If we had more guest I would have 100% taken the guest house as well and encourage it if you so choose. Our plans were to get engaged on Flat Head Lake..... but the home was so amazing we chose their dock as the sunset on the mountain tops for the big question. I guess... I chose since it was a surprise an all. Getting to the house was easy, everything we needed was perfect.....The house is very private and we truly enjoyed the beautiful, peaceful setting. I have stayed at many homes while using VRBO and the only word that describe the Van Atta place is HOME. You feel home! thank you for sharing your home and creating a memory that will never be forgotten. Kalispell is only 30 miles to the north; Polson is 23 miles to the south; and the charming town of Lakeside is only six miles away. Just the drive to these places is worth the trip to see the magnificent views, speaking of which, Glacier National Park is but an hour away, The quaint village of Bigfork is just around the lake, where you may enjoy live professional theater during the summer. Each town offers a variety of activities, some of which are unique to the area. Skiers: Blacktail Mountain is approximate a 40-minute drive and Whitefish Mountain is just under an hour away. Watercraft of all kinds may be rented in Lakeside, which is only six miles away. A darling guest house is available to rent for those who already are renting the Main Home. The Guest House is for rent ONLY to those who already are renting the Main Home. It does not rent by itself. For renters of the Main Home who have more than eight overnight guests to accommodate, the Guest House is a renting option. It is beautifully decorated in a lodge- and cottage-style theme. It has a kitchen, a full bath with shower and tub, a queen-sized bed, a pull-out sofa, and a deck that boasts spectacular views. $350 per night (for two people-$100 extra for three people); $300 cleaning fee; $59 VRBO Insurance; 7% Montana bed tax; $800 refundable damage deposit.